A good breakfast/brunch spot is not hard to find in Brooklyn. It seems walking around the neighborhood on any given weekend, casual dining restaurants are opening early to please a mimosa and omelet crowd. I’m not mad about it. I first came to Dizzy’s Diner when visiting my boyfriend’s brother and sister-in-law, who live in Park Slope — months before I event knew I’d be moving here one day. They were fantastic showing us around the area and took us to Dizzy’s for a late Sunday brunch. Now as a Brooklyn resident myself, I just recently took a good friend of mine who was visiting for the weekend back to the Park Slope diner. Here’s a little spotlight on the joint. First things first, this spot is cash only. But with the on-site ATM, you won’t ever be out of luck after finishing a great meal to start the day. Looking to get your money’s worth in the morning? Dizzy’s is where it’s at. All brunch menu items include a small basket of homemade muffins and biscuits, glass of juice, bottomless cup of coffee or tea + your first mimosa on the house. That in itself would be enough to get me in the door. And we haven’t even talked about the actual meal yet. With daily specials, I went with the Banana & Blueberry French Toast, that was calling my name as soon as we walked by the place. 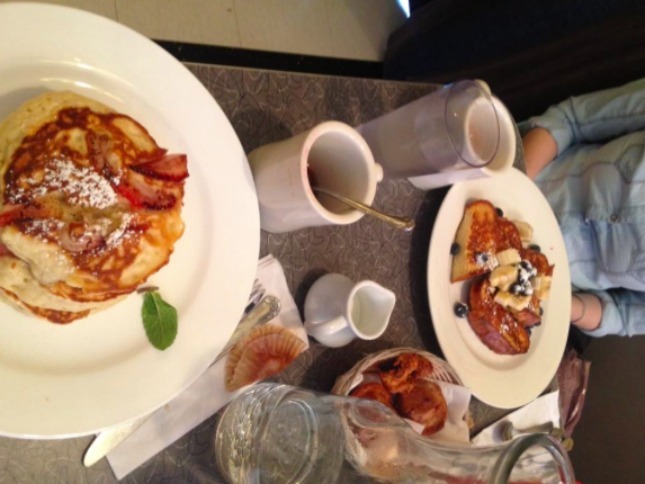 My friend ordered the Strawberry Pancakes… needless to say, we we’re in a sweet tooth sort of mood. Pass along the syrup and call it a day. Sufficietly fueled up for the afternoon, we walked off the filling brunch down 5th Avenue in Park Slope and explored a few shops and boutiques around the area. Chalk that up as a successful Sunday morning. Tags: BANANAS, breakfast, BROOKLYN, BRUNCH, COFFEE, DINER, DIZZY'S DINER, FRENCH TOAST, FRUIT, PARK SLOPE. Bookmark the permalink.